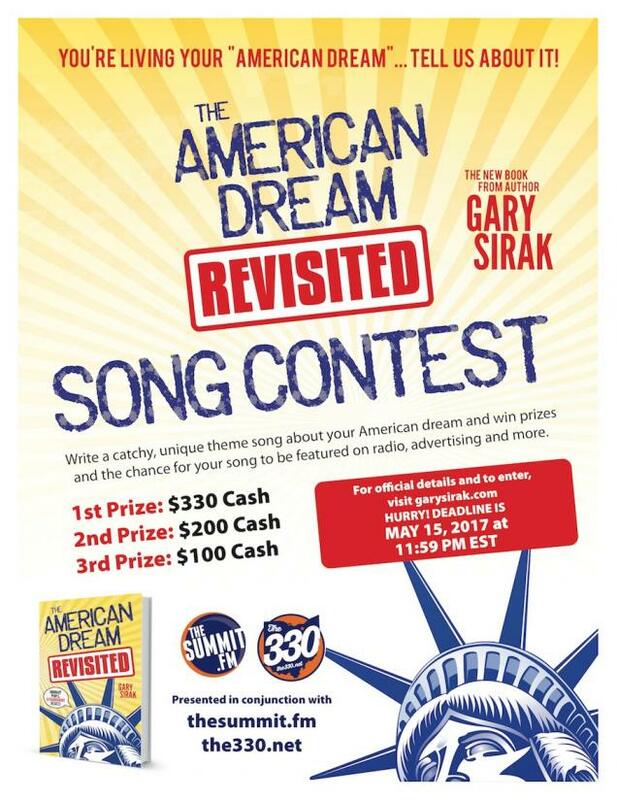 Author Gary Sirak, in coordination with 91.3 The Summit, broadcast out of Akron, OH, announces The American Dream Revisited Songwriting Contest. CANTON, Ohio - March 14, 2017 - PRLog -- Author Gary Sirak and 91.3 The Summit announce a songwriting contest that is open to all musicians and musical dreamers. "The American Dream has always been a very personal topic for me," stated author Gary Sirak. "Writing a book was one of my American Dreams, and I accomplished that … twice. My goal has always been to help and motivate as many people as I can. I have always liked music and I thought a songwriting contest would be a great and fun way to help up-and-coming musicians take a step towards their dream." · The song entry must be an original piece based off The American Dream. All genres will be accepted. · Lyric Standards: The lyrics are not to be obscene or have questionable/inappropriate content. Should any of the lyrics not meet the standards of author Gary Sirak and 91.3 The Summit, the applicant will be disqualified from the songwriting contest. · The individual or music group must have all rights to the song and be willing to license the music to author Gary Sirak and 91.3 The Summit for use of online distribution and for promotion purposes. · The individual or group member must be 14 years or older. If participants are under the age of 18, there must be written consent from a parent or legal guardian. The winning individual or band will be publicly announced no later than three (3) weeks after the deadline of May 15, 2017 and receive a $330 cash prize. The second-place winner will receive $200 cash and the third-place winner will receive $100 cash. The top three winners will have their song publicly released and broadcasted on the Gary Sirak author website, 91.3 The Summit, 90.7 Youngstown and the 330.net. In the future, author Gary Sirak is looking to release The American Dream Revisited EP, which will feature the top three individuals or bands. Additional prize details to follow. Contest judges include Gary Sirak, singer/song writer Ryan Humbert, the staff of 91.3 The Summit and The American Dream Revisited Marketing & Event Coordinator, Rachel Jervis. For more contest details and how to enter, visit www.GarySirak.com.